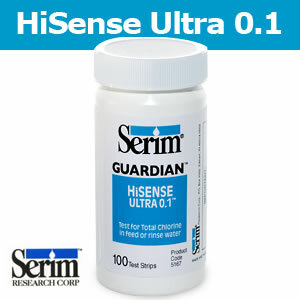 Serim® GUARDIAN™ HiSENSE ULTRA 0.1™ detects the total chlorine concentration (free chlorine and/or chloramine) in feed water used to prepare dialysate. The test can also be used to detect residual chlorine bleach in the solution used to rinse dialysate lines following disinfection of hemodialysis machines. 1. Core Curriculum for the Dialysis Technician. Third Edition, pg 244, 2006 Amgen, Inc.
2. AAMI Standards and Recommended Practices, Dialysis, 2008 Edition, RD62 – Water treatment equipment for hemodialysis applications, Association for the Advancement of Medical Instrumentation, Arlington, Virginia. Collect a sample of water after the first carbon tank2, 3, 4 and test it according to the HiSENSE ULTRA 0.1 directions. If the results are positive, a second sample should be taken immediately after the water leaves the second tank. If there is chlorine leaving the second tank, dialysis should be discontinued in the facility. Collect a sample of rinse solution from the drain line of the hemodialysis machine. Testing for residual chlorine bleach is performed during the rinse cycle of the disinfection procedure and before initiating the next dialysis. Sample Fill sample cup with ~20 ml of post-carbon water, discard and re-fill with another ~20 ml of water. Test Strip Technique Immerse indicator pad in water sample and swish vigorously for 30 seconds. Remove strip, shake off excess sample.